My first cat died when I was five years old. It's a hazy memory, to be honest: I don't recall all of the details, but I still remember how sad I felt and how difficult it was to accept that Bob (I named him myself) wasn't coming home from the vet's office. This is what I understood: Bob was sick, and he went to the doctor to get better. He had to have an operation. I had recently been to the emergency room for stitches after a nasty playground fall, so I understood about doctors and hospitals. But nothing had prepared me for the possibility that Bob wouldn't return. My father was the one to tell me. He was honest. He told me that Bob was a really sick cat, and the vet had done everything he could, but he just couldn't make my cat well again. He told me that Bob was dead, and that now he wouldn't be sick anymore. He also told me that it was okay to be sad; he was sad, too. And I was sad. I cried. I was angry. I ran to my room and shut the door. I said that I never wanted another cat as long as I lived. I meant it, too. A part of me felt like Bob would come back: I knew he was dead, but what was dead, exactly? I asked a lot of questions that probably made my parents uncomfortable, but they did their best to answer anyway. It took a while, but I eventually accepted Bob's death. A year or so later, I asked my Dad if we could maybe get another cat. Be honest - Nobody wants to see their child upset, but you should resist the urge to lie about your pet's situation for the sake of your child's feelings. Have an age-appropriate conversation with your child about death, and answer all of her questions as truthfully as you can. It's never a good idea to tell your child that her pet ran away – this can lead to feelings of abandonment, and she may spend weeks or months waiting for her pet to return. Tell your child's teachers and care givers - Your child may become withdrawn or depressed after the death of a family pet; younger children may “act out” at school. Make sure that your child's teachers or day care center know what's going on at home – they can be an extra source of support for your child. Be a role model - Share your feelings about the death of your family pet, and let your child know that it's okay to be sad or cry. 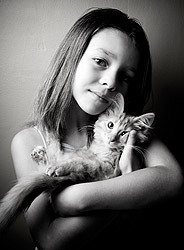 It's important for your child to know that there's nothing wrong with grieving for a lost pet. Have a memorial service - A memorial of some kind helps bring a sense of closure after the death of a pet. You can hold a funeral for your pet, or you can do something else to celebrate your pet's memory: Plant a tree, make a collage of photographs, or talk about your favorite memories. Involve your child in the plans. Death is a natural part of life. It's not easy watching your child grieve, but the best thing a parent can do is be supportive and honest. Don't be afraid to discuss your pet's death, and don't be afraid to tell the truth.